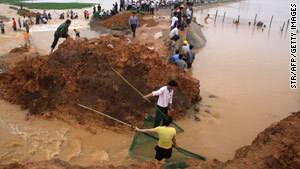 Villagers build a temporary dam at their field after a rain storm hit China's Guangxi province. Beijing, China (CNN) -- The death toll has risen to 38 as a result of rain-triggered landslides in southern China, the state-run Xinhua news agency reported Thursday. Heavy rain has saturated parts of China's Guangxi Zhuang Autonomous Region this week, causing landslides in some places. More than 80,000 local people were evacuated from their homes by Wednesday night. More than 2.1 million people in Guangxi were affected by the disaster, and more than 4,200 homes had been damaged, the news agency has said. Floods across China have left 125 people dead and another 34 missing this year, Xinhua reported, citing the Office of State Flood Control and Drought Relief Headquarters.